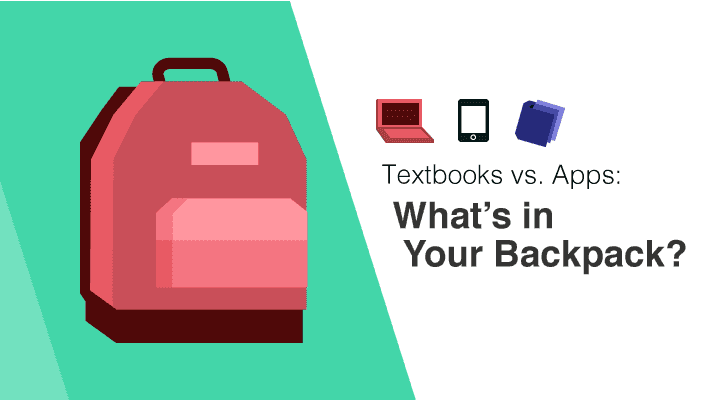 Textbooks vs. Apps: What’s in Your Backpack? Has the digital revolution saturated higher education? At OneClass, we were curious to find out if students are still carrying 16 to 20 pounds of textbooks to class each day or if e-textbooks have replaced them. We were also curious to find out what is the best way to choose the right apps that can help your GPA. The question of high tech versus lo-fi learning tools is pervasive, but after surveying hundreds of college students, we got some valuable insights into how students prioritize between textbooks, interactive tech tools, and educational apps. Find out what your friends are using to study. Have College Classes Gone Paper-free? When we asked what materials college students brought to class, we found out that 50 percent of college students didn’t bring any textbooks to class. Rather being used during class, many textbooks are being left at the dorms for homework assignments, studying, and reference. About one third of college students use digital textbooks in class on their laptops or tablets. Only 16 percent of students carry printed textbooks. What do college students bring to class? According to an analysis from Morehead State University, the use of textbooks during college lectures has been impacted by the emergence of PowerPoint slides. In many cases, what’s covered in lectures is a better representation than textbooks of what the exams will include. Additionally, the technology makes it easy for the professor to add a textbook snippet to a slide deck, which is arguably a better alternative than trying to get a lecture hall full of students to carry a 5-pound hardcover. Are Digital Textbooks the Preferred Choice? The type of study material college students prefer is influenced by their reading habits, homework behaviors, and budget. E-textbooks are used by just over a quarter of college students, with the remaining students opt for some form of hard copy. What type of textbooks do college students prefer? The most popular textbook choice is used paper books. Students choose secondhand textbooks because of their low cost. However, the price of e-textbooks has also been dropping. In the past two years, average prices of e-textbooks have fallen by 31 percent overall, and for subjects such as math, e-textbooks prices have decreased by almost 50 percent. How Has Technology Changed Lecture Materials? Textbooks aren’t the only aspect of college classes where digital tools are influencing learning. Note-sharing apps have created digital spaces where students can freely exchange materials. The note-sharing app OneClass has been used by more than 2.2 million students, 90 percent of whom have improved by at least one letter grade. Our student survey revealed that students find shared notes from math classes to be the most valuable. This is followed closely by notes for biology classes. For Which Courses Do Students Find It Useful to Buy Online Class Notes? For many students, using online class notes is a good solution for getting better grades. Rather than generic concept explanations, the notes are shared by students who may be sitting just a few rows away from you. The class notes are useful if the professor moved too quickly during a lecture, if you’re struggling with the material, or if you’ve missed a class. The benefits aren’t limited to accessing notes by other students in your class. Uploading class notes is an opportunity for students to earn cash or gift cards by sharing notes that they’re already taking. Some note-takers also use site currency earned from uploading notes to download notes for another class they’re struggling with. How Do Students Evaluate Shared Class Notes? Prior to online marketplaces for class notes, it was common to borrow a friend’s notes. Yet, only in the best-case scenario would that friend be the smartest person in the class. The quality of shared notes is significantly important to students. With an unlimited subscription to online class notes, students are able to access all available materials and choose what notes are most valuable. What Feature Is Most Important to Students When Buying Notes from an Online App? To encourage note-takers to share high-quality materials, OneClass’ Elite Note Taker program increases compensation threefold for students who take superb notes. Raising the bar for shared notes also increases the quality of notes that are available for download by other students. The increasing availability of digital tools such as online notes and e-textbooks are creating more opportunities for students to study smarter and get better grades. Learn more about how OneClass’ shared class notes and study guides are helping millions of students improve their GPA.